Wanting to try out a new build you’re not sure will work without putting 15 hours into it? Simply like to cheat and have everything at your disposal? 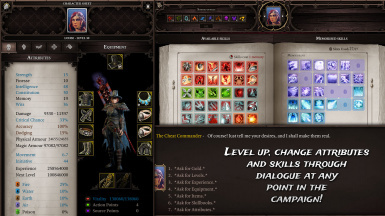 The Cheat Commander allows simple and fast character levelling, equipment generation, skillbook acquisition, gold and more, at any stage in the main campaign! Beta update for the Definitive Edition of the game. Added a Cheat Book to summon a Cheat Commander wherever you want to. Cheat Book will be granted automatically at the start of the campaign, or retroactively granted to party heroes on save game load when activating the mod on old saves. Can also ask the Cheat Commander for a new book on demand. Added ability for the Cheat Commander to give out extra Swornbreakers. Possible fix for some save files still not showing the NPC. Fixed an issue where the cheat commander could be killed, most notably in the tutorial. Ressurected the cheat commander in any existing save games where he had managed to be killed. Added the option to manually tweak civil abilities like the old version of the mod, to allow for civil abilities above the normal caps. These cannot be removed, so use this wisely! Attempted to fix NPC not appearing on some save games. Please send me your save if it is still not working so I can take a look! Added the ability to add tags to your character (any of the character creator tags alongside hero and villain). Updated the civil ability boosting to use the newer functionality added by Larian in a patch, so that it isn't using the old workaround. Added a new spawn for the Cheat Commander in the pilgrim camp outside the city of Arx for players who do not have access to his previous spawn location. Added a custom portrait to the Cheat Commander. Fixed issue where the cheat commander NPC would duplicate himself during an act transition. Force cleanup of any duplicated cheat commander NPCs created by old mod versions on area load. Added missing skillbooks for Fortify, Apportation, Cleanse Wounds, Mass Cleanse Wounds, Summon Inner Demon and Blood Storm. Added option to obtain Eternal Artefacts A and C for crafting. Added common rarity equipment to trade stock alongside the epic/divine rarity gear. Wanting to try out a new build you’re not sure will work without putting 15 hours into it? Looking to speed through the game quickly to gather info for wiki documentation? Simply like to cheat and have everything at your disposal? 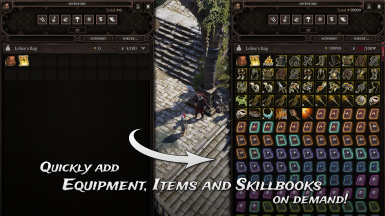 The Cheat Commander allows simple and fast character levelling, equipment generation, skillbook acquisition, gold providing and more, at any stage in the main campaign! This mod is made to be easily enabled and disabled at any point during the campaign. Want to level up to 30 and deck yourself out in epic gear while still on the boat to Fort Joy? No problem. Anything you add to or modify on your characters will remain even after disabling the mod! Looking for the Definitive Edition? If you want to use the Cheat Commander with the definitive edition of the game, check out its mod page over on the definitive edition section of the nexus! 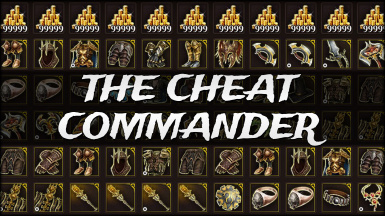 What can the Cheat Commander do exactly? How do I use the Cheat Commander? 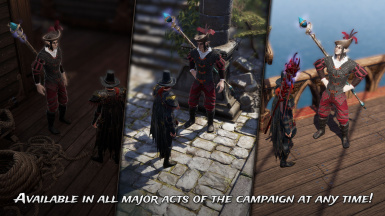 The Cheat Commander takes the form of a well-dressed elf who will help you cheat when spoken to. In the ship to Fort Joy at the beginning of the game, he stands in the lower decks immediately after walking out from the starting room. Once arriving at Fort Joy, he stands next to the very first waypoint you discover on the shore. After you get the Lady Vengeance, he stays onboard for the rest of the game, near the waypoint entry location of each act. When you make it to Arx, if you don’t have access to the Lady Vengeance anymore, he stands near the waypoint in the pilgrim camp outside of the city. Otherwise, he will remain of the Lady Vengeance inside the halls. Can I summon the Cheat Commander anywhere? With the new addition of the Cheat Book, which is granted when starting a new game or loading an existing game with the mod enabled, you can use the book to summon a Cheat Commander anywhere you’d like! Activating in an Existing Save Game? While there should be no issues using this mod with a pre-existing save, the very first load screen when activating a mod in an existing save game can take a bit longer than usual, depending on your hardware and how far into the game you are in your save. This is something that happens with all story mods, as the game has to reload a lot of information to merge the mod into your savegame. If you get through this long first load time, and then save the game, future loads go back to normal, so don’t worry about it happening every time! Help! I can’t find the Cheat Commander! First of all, make sure you’re looking in the right place! Each location is described in the above section “How do I use the Cheat Commander”. If you still cannot find the NPC, it’s possible your save game has lost him! This is a problem affecting a couple of users that I have so far been unable to figure out why he no longer wants to appear. However! With the new addition of the Cheat Book, you should be able to summon the Cheat Commander, even if he has decided to stop showing up at his normal spawn locations! I hope you enjoy the mod, thanks for checking it out! Over time I plan to do further updates to give even more options!